Every year we plant a few new (to us) tomato varieties to see how they grow in our garden, and one of our new favorites for this year is the Amish Paste, a meaty plum tomato that doesn’t have too much juice, so it’s perfect for sauces and salsas. Our plant has grown huge, over 9 feet tall, and has been a prolific producer of smallish 2-ounce tomatoes. 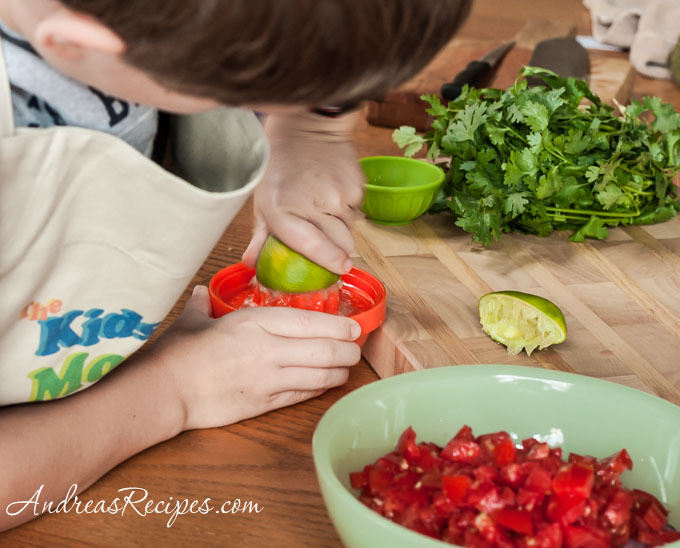 Hockey Guy and I picked some to make this salsa fresca, a simple no-cook salsa that young kids can help with and older kids can tackle on their own. The work is all in the chopping, and Hockey Guy had a fun time practicing his knife skills on the tomatoes, garlic, and cilantro, while I chopped the onion and jalapeno. He did a fine job dicing the tomatoes. And he really liked juicing the limes. 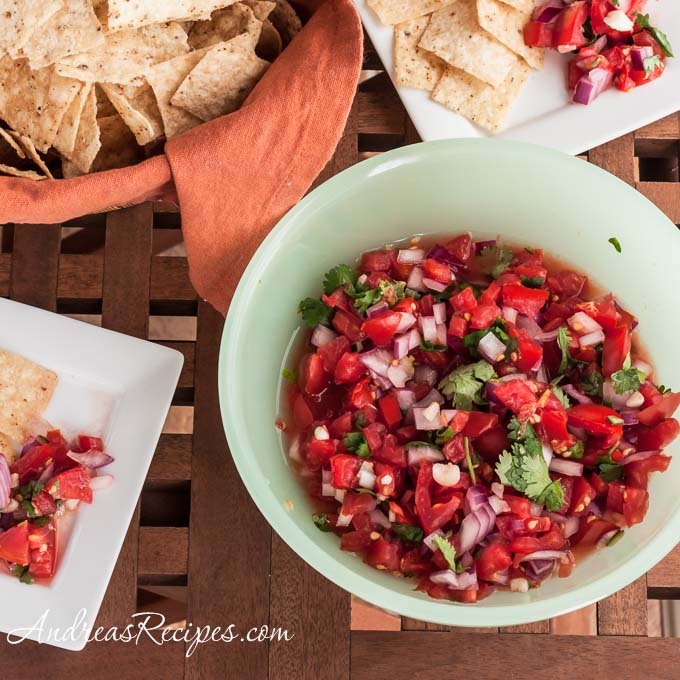 The salsa makes a great appetizer, or you can spoon it over any kind of Mexican food, an omelet, or scrambled eggs. Demonstrate and assist with any tasks that might be new: slicing, chopping. 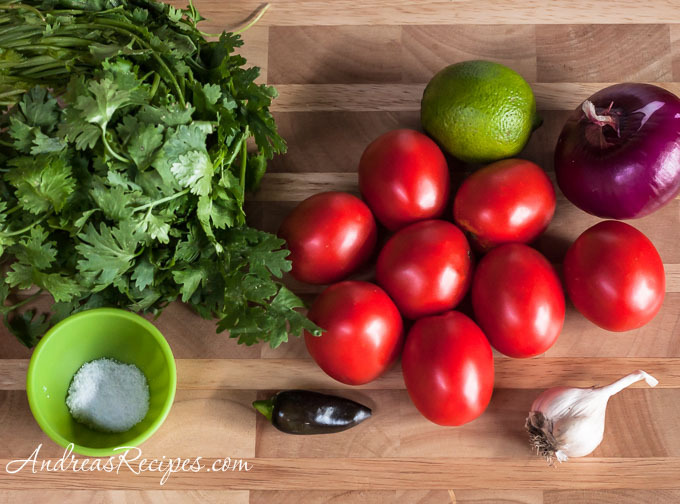 Onions can be a little tricky to grasp while chopping, so let an adult take on that job if you are making the salsa with young children. Young children should not handle sharp knives. 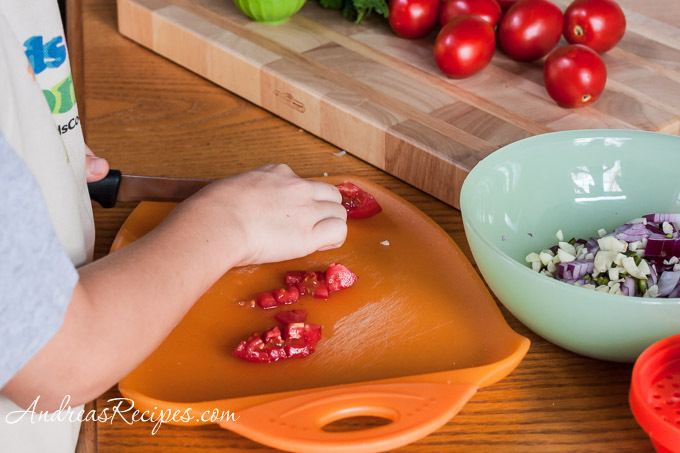 Teach older children knife safety, such as keeping fingers back from the blade, and laying the knife down on the board when not in use. 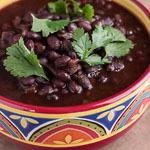 Toss all of the ingredients together in a bowl and stir. 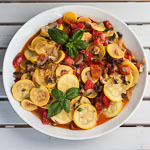 Allow to rest for at least 15 minutes, then serve. 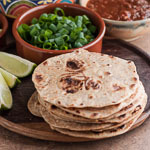 Refrigerate any leftovers for up to 3 days.